For the Mechaphile inside us all. 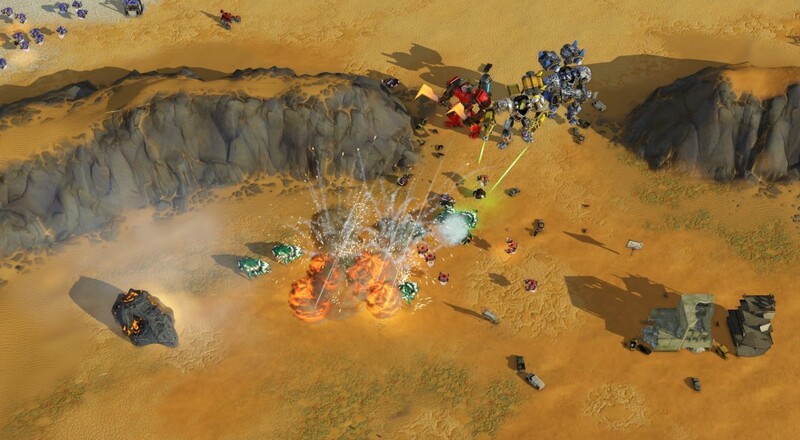 Many of the minds who brought us mainstays of the RTS genre, such as Age of Empires and Age of Mythology have converged at developer Stardock Entertainment to introduce Servo, a brand new sci-fi RTS. The game debuted at PAX East last week, and features large metal monstrosities bludgeoning the circuits out of each other, locked in the eternal prison of real time strategy. A co-op mode is included from the outset, because who wants to send soulless robot minions to die on some battlefield by themselves? Sure, screenshots might suggest Servo is simply another RTS game (not that there's anything wrong with that), but it possesses a unique form of unit upgrading not usually seen in the genre. Missions unlock parts which you can use to improve your individual units, which only works in a setting with robots. You wouldn't want to to be knee deep in a Command and Conquer mission, only to discover a brand new thigh to slap on your Spetsnaz that makes him run faster. That'd just be gross. Check out what the team down at Stardock has to say about Servo. Mankind has abandoned Earth after they've completely botched it, fleeing into deep space. Once they spent a few years bumming around the vast nothingness which space has to offer, they collectively decided that a totally trashed Earth might not be that bad, and headed back home. Servo is still currently in Alpha, and can be preordered from Stardock's website for $19.99. It is expected to rampage onto Steam's Early Access before being released later this year. Page created in 1.6092 seconds.